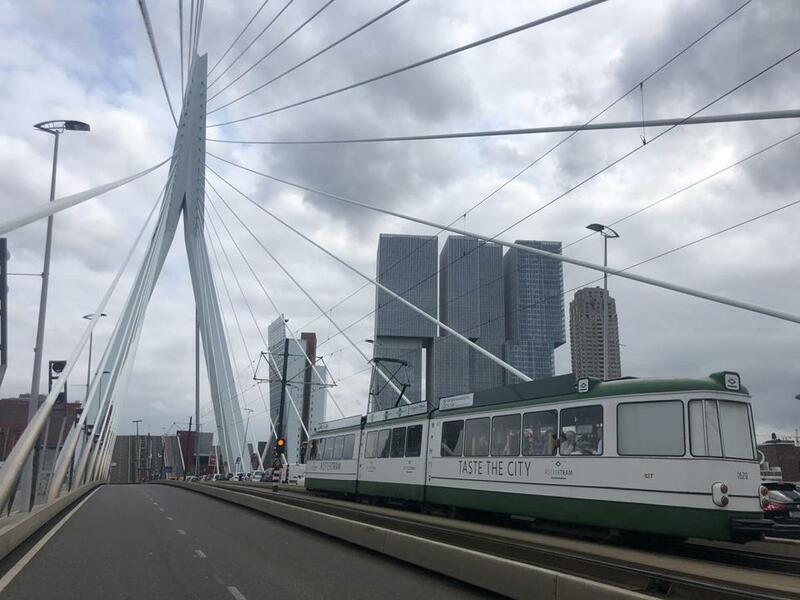 The RotterTram on Erasmus Bridge in Rotterdam. The vintage 1969 tram is now used as a dining car and does a complete tour of the Dutch city. When Suzanne Knegt took skyline photos of her hometown, she would wait for a tram. That image of a tram in the foreground crystallized her vision of the Dutch city known for its modern architecture and giant port. Knegt recently turned her affection into a business — RotterTram — a sightseeing tram that doubles as a dining car. Open for business since the summer, it offers a fixed-price meal with drinks during the course of a ride that lasts 2½ hours and travels over some 18miles of tracks throughout the city. It runs every Wednesday through Sunday evening and is also available for private parties. Knegt expects to offer lunch trips soon. Sights along the way include the stylish cable-stayed Erasmus Bridge; Coolsingel, Rotterdam’s promenade and shopping street; and Delfshaven, the historic harbor and one of the oldest places in the city. Information is shared with guests via tableside tablets. English versions will be offered soon, said Knegt, whose initial customers were primarily Dutch but are now growing more international. Part of the appeal is the tram itself, a vintage 1969 model that stands out with its green and white façade and lines of gleaming steel. Knegt, who bought the tram partly with crowd-sourced funds, overhauled the inside to add dining tables, a modern kitchen, and restroom. The car, divided in two dining sections, holds a total of 44 people. Not only is it popular with diners, onlookers get a kick out of seeing people dining in a tram car, Knegt said. Departs Wednesday through Sunday at 6:30 p.m. from Willemsplein and returns at 9 p.m. Price of $92 per person includes fixed-price four-course meal, including drinks. Vegetarian and custom orders can be arranged. Reservations are required and can be made only in even numbers. For an odd number of diners, a surcharge will be added.